Miso soup is a staple Japanese food. It’s not much of a stretch to say that almost every Japanese eats miso soup everyday. I surely grew up eating it almost everyday, and even twice or 3 times a day! It’s one of the key ingredients to health, as miso is a superfood. It lowers cholesterol, protects against radiation and cancer, aids digestion, has all the essential amino acids, vitamins including B12, minerals and is chock full of probiotics. So it was time to take this golden staple and make it raw. And surprisingly, it was quite easy. 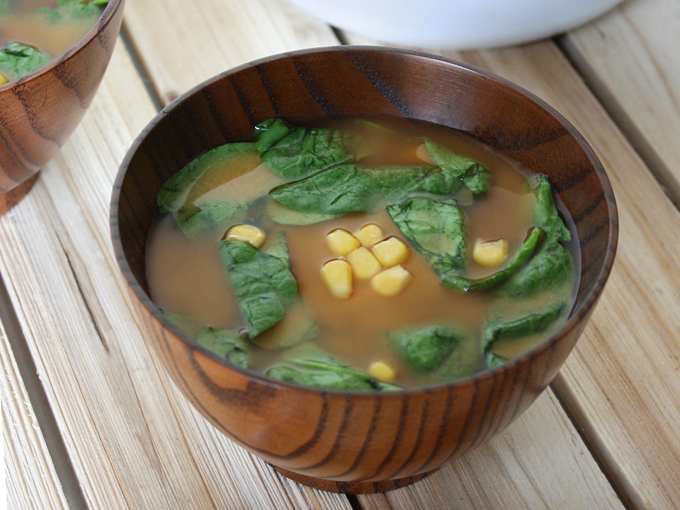 You can still have a warm bowl of raw vegan spinach and corn miso soup while still keeping it raw. Now, if you were only introduced to miso soup at Japanese restaurants, you might think miso soup is always made with a little tofu, sea weed, and green onion. But miso soup just means miso based soup, so we eat it with any vegetables you can think of, except for broccoli and bell peppers! That’s just too weird for us. I grew up eating miso soup with individual and combinations of onions, potatoes, carrots, corn, sea weed, spinach, cabbage, tofu, fried tofu, daikon radish, kabu radish, shitake, you name it. Miso soup is just a vehicle. There is no set ingredients in miso soup, except for dashi, miso, and water. Dashi means stock in Japanese. 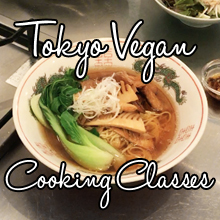 It is the basis of Japanese cooking and almost every traditional dish is made with it. It is typically made from either bonito flakes, dried sardines, kelp, or shitake mushrooms, and is sometime a blend. This is why it can be hard to eat plant-based in Japan, because the dashi made from fish are used in everything, and you won’t necessarily see it in the finished product. 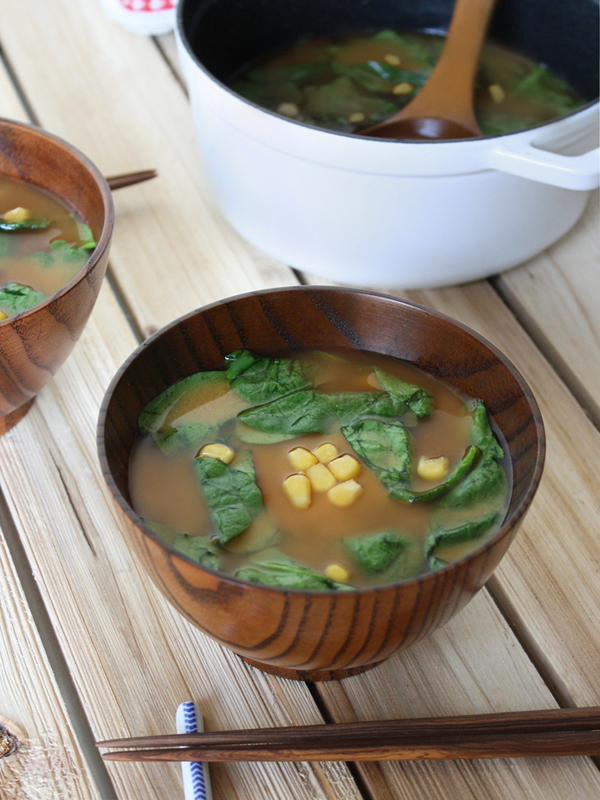 So miso soup consists of dashi, miso, and the veggies of your liking. But for a raw food miso soup, there are some veggies that would do better than others. For this recipe, I am using wilted baby spinach to mimic the cooked spinach and some frozen corn (I couldn’t get fresh ones since it was out of season). Miso is essential to miso soup, but what is miso? Miso is fermented soy bean paste. Check the ingredient list when you are buying miso at the store. It should only list 3 ingredients, soy beans, koji (fermented rice), and salt. There are different types of miso, red, white, barley, etc. Red miso is richer and deeper in flavor and has a darker, reddish brown color. White miso is milder in flavor and is a lighter yellow color. Barley miso uses fermented barley instead of koji, and has a fragrant aroma from the barley. Generally, northern Japan uses red miso for miso soups, and southern Japan uses white miso for miso soups. There is no right or wrong miso to use. It’s just preference in flavor. I’m from Tokyo and I grew up with red miso and “awase miso (a mix of both red and white)”, so I like using red miso or chick pea miso for a soy free option. Chick pea miso makes a mellower, milder, sweeter miso soup. I like them both though chick pea miso is not necessarily traditional. I have homemade miso and homemade chick pea miso fermenting right now so I can’t wait for it to be ready this winter to try. Now let’s make some miso soup! First we start with making the dashi. We will be using kelp, a type of seaweed. You can find it at Wholefoods, health food stores, and Asian markets. This is the brand I like using. Cut a piece of kelp into roughly 4″ x 4″ piece (if it’s shriveled up, just roughly measure the length) and let it soak in water overnight. Take out the piece of kelp when it is ready. The leftover soaking water is the dashi. You can cut the removed kelp into small pieces, freeze it, and add it into your smoothies for added iodine. 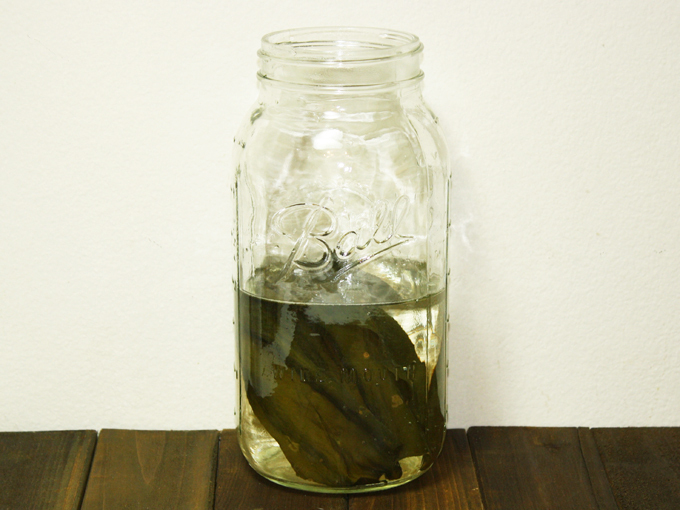 Here’s my favorite trick if you are pressed for time or forgot to soak the kelp. It’s kelp powder! It is essentially an instant dashi. The fine powder will melt in the water to make instant stock. If you can’t find kelp powder in Asian markets, you can easily make it yourself but pulverizing the dried kelp in a blender, then use a coffee grinder to make it into a fine powder. Run it through a fine mesh sieve to get rid of any larger kelp pieces. When the dashi is ready, place the spinach in a bowl and add in a pinch of salt and massage until it is wilted then let it sit for a few minutes. Pour the dashi into a sauce pan. 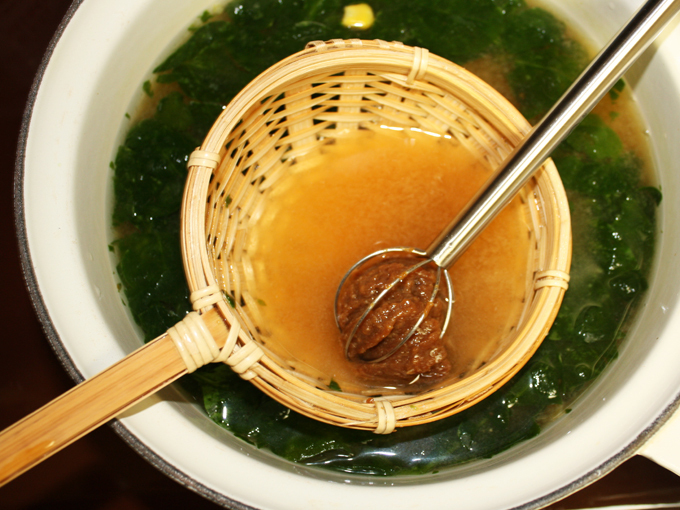 If you are using kelp powder to make instant dashi, add in water to the sauce pan, then the kelp powder and mix well. Wring out the spinach well and add it in with some corn. Heat it up on the lowest flame to about 110℉. 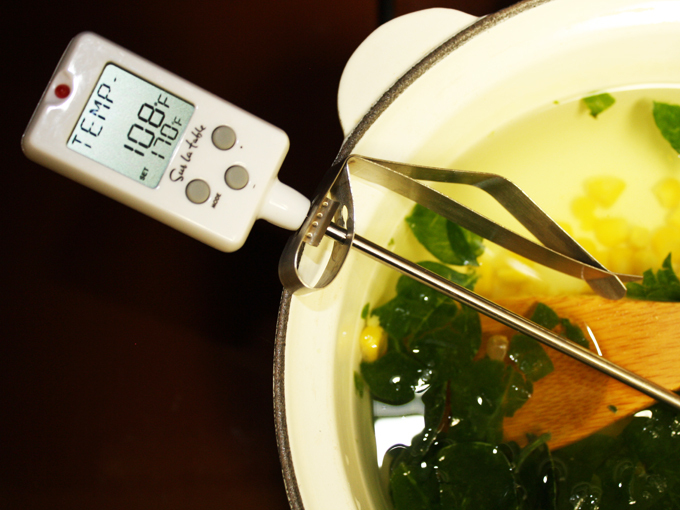 Check the temperature constantly so it doesn’t overheat, and stir constantly to ensure there are no hot spots. Once the temperature reaches around 110℉, turn the heat off. It’s time to add the miso to finish it off. This is the same with when you are making cooked miso soup. You are supposed to cook everything in the dash first, turn off the heat, then put the miso in. You are never supposed to boil it over. In a small sieve, put the miso in and melt it in the soup using a spoon. Since we are not cooking the miso soup, this method will ensure there are no miso balls or bits that didn’t melt in the liquid. Check the temperature once the miso is completely melted. If the temperature lowered, reheat on the lowest flame until it reaches about 110℉. Be sure to stir constantly to avoid hot spots! There you have it, raw miso soup! Transfer it into a bowl, and dig in straight away before it cools off! Cut a piece of kelp into roughly 4" x 4" piece (if it's shriveled up, just roughly measure the length) and let it soak in the water overnight. Take out the piece of kelp when it is ready. The leftover soaking water is the dashi. Place the baby spinach in a bowl and add in a pinch of salt and massage until it is wilted. Let it sit for a few minutes. Pour the dashi into a sauce pan. *If you are using kelp powder to make instant dashi, skip the soaking part and add in water to the sauce pan, then the kelp powder and mix well. Wring out the baby spinach well. Add the baby spinach and corn into the sauce pan. Heat it up on the lowest flame to about 110℉. Check the temperature constantly so it doesn't overheat, and stir constantly to ensure there are no hot spots. Once the temperature reaches 110℉, turn the heat off. In a small sieve, put the miso in and melt it in the soup using a spoon or whisk by rubbing it against the sieve. Check the temperature once the miso is completely melted. If the temperature lowered, reheat on the lowest flame until it reaches 110℉. Be sure to stir constantly to avoid hot spots. Transfer into bowls and serve immediately before it cools off. Miso's saltiness varies depending on the brand and type of miso you are using. Adjust the amount of miso you use according to taste. You can cut the removed kelp into small pieces, freeze it, and add it into your smoothies for added iodine. 1. Cut the kelp into smaller pieces and blend in the blender until powdered. 2. Transfer into a coffee grinder and finely grind until it becomes a fine powder. 3. Run through a fine mesh sieve to get rid of any larger kelp pieces.